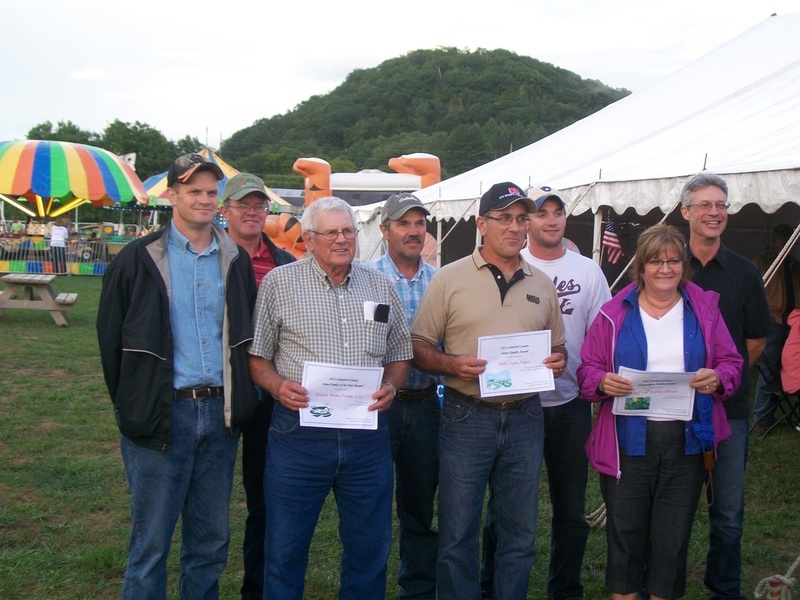 Thursday, August 9th at the Crawford County Fair, the 2012 Land Conservation Awards were presented. The Land Conservation Committee presented each award winner with a Leopold Bench for all their hard work and dedication to conservation practices. Benches were presented to the following award winners: Farm Family of the Year - Kvigne Boma Farms, LLC, Water Quality Award - Mill Coulee Angus, Conservation Forestry Award - Jeff & Jeanne Christie, Outdoor Educator - Armund Bartz, Wildlife Conservation Award - Dave & Roslyn Radke, Natural Resource & Ag Leadership Award - Mark Forsythe. Accepting awards were (from left) John Kvigne, Steven Kvigne, Stephen Kvigne, Mark Pedretti, Tracy Pedretti, Ryan Pedretti, Jeanne Christie & Armund Bartz.